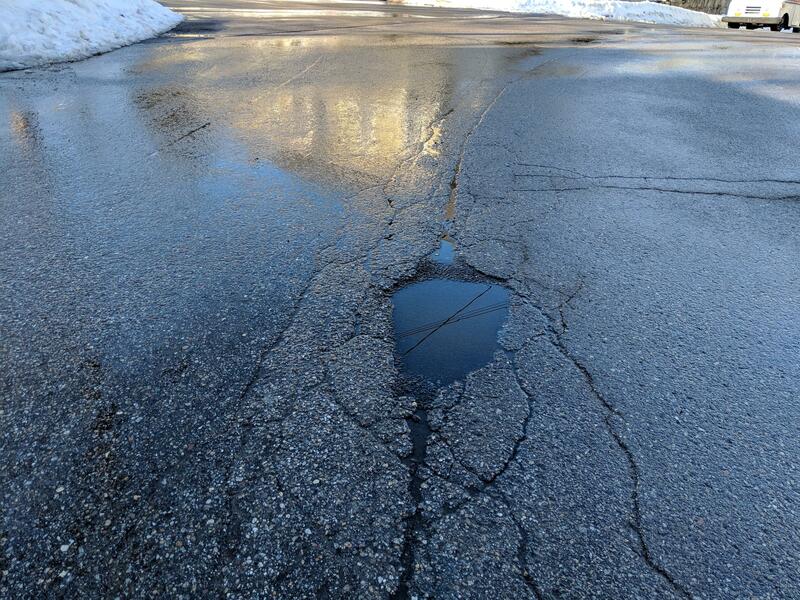 Meltwater fills a new pothole in Somersworth. New Hampshire drivers may start to notice bumpier roads in this latest thaw after a cold snap – both damage and weather that could happen more often as the climate warms. State Department of Transportation spokesman Bill Boynton says New Hampshire has a high rate of freeze-thaw cycles – where temperatures fall below freezing then rise above it in a short time, melting snow and ice into water on roadways. “That gets into the cracks, it freezes, it expands, it breaks up the pavement, cars run over it, vehicles run over it and now you have a pothole,” Boynton says. He says many of the state’s secondary roads are old and not built with good drainage, causing more ponding and water damage. But a poorly drained roadbed is hard to fix without massive repairs. Instead, Boynton says the state focuses on preventing potholes through regular re-paving of its 4,600 road miles. The DOT also closes some at-risk roads during the spring thaw – also known as mud season – to prevent heavy trucks from exacerbating winter damage. The New Hampshire Municipal Association cited research in 2008 that says these restrictions increase the life of pavement by 10 percent. Meanwhile, New Hampshire’s winters are some of the fastest-warming in the country. Research – including some cited in the recent Fourth National Climate Assessment – suggests this region will also see more precipitation and volatile temperatures in the coming decades, causing more potholes, frost heaves and washed-out road beds. Last week's cold snap gives way to much milder temperatures this week. Climate scientists say it’s all part of a warming trend in New Hampshire – where winters are heating up faster than in most of the rest of the country. New research shows the state is on the leading edge of an increase in annual low temperatures across the country. The state is testing a new way to keep beavers from clogging up culverts and flooding roads. Engineers from the Department of Transportation have installed two “"beaver deceivers" on Route 28 in Londonderry, just east of Manchester-Boston Regional Airport.